It was very important that this wedding start on time because there was a wedding immediately following. 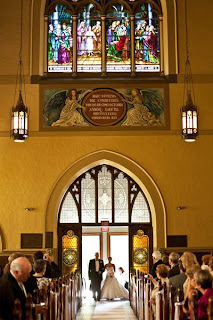 The Chapel at Lehigh University gives you 2 hours, one to set up and one for the ceremony. I like to start the mothers processional about 2 minutes before hand so the bride walks on time! Here is a non professional picture of me getting Erika and her dad ready. Advice I tell all my brides - take a deep breath, maybe 2 of them, hold your bouquet low (close to your hip bone) and don't walk until Your music starts and the guests stand. Her veil was about 10 feet long so my assistant and I had her walking through the doors and still poofing!